Pola Roupa gets life plus 25 years jail accused of blowing up Greek Central Bank without victims. 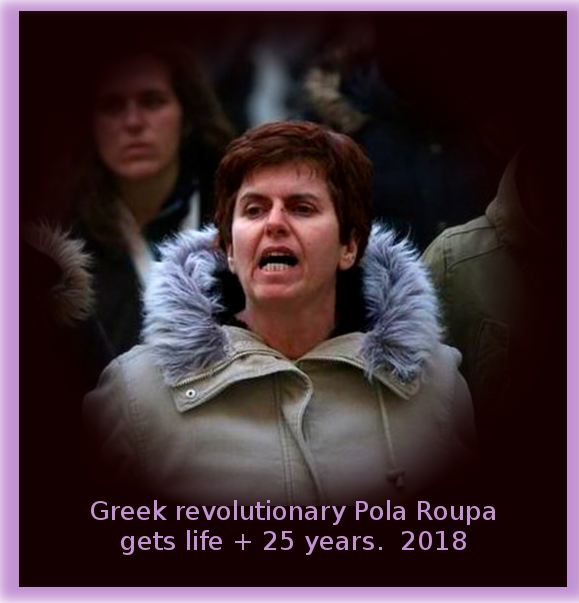 Pola Roupa, a member of Greek urban guerrila group Revolutionary Struggle, has been sentenced to life and 25 years imprisonment over the bomb attack on the Greek National Bank and the offices of the IMF in Athens in April 2014. The attack destroyed the front of the National Bank. Nobody was hurt, as people who conducted the attack took precautions and informed the authorities before the blast, allowing enough time for evacuation. 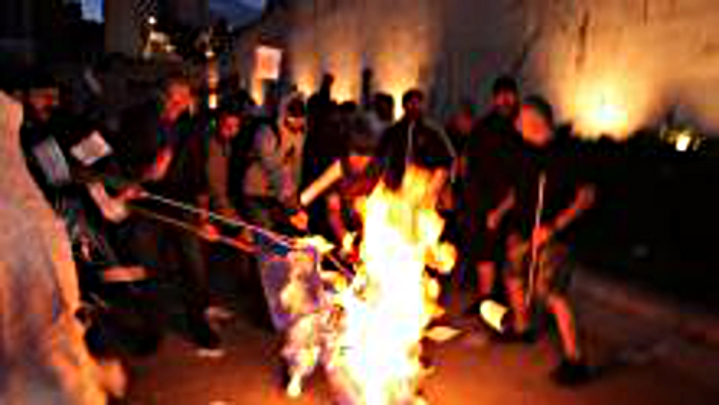 Author thefreeorgPosted on July 14, 2018 Categories anarchist, anti fascist, anti-nationalist, collapse capitalism, crooks and liars, dictators, social revolutionTags Anarchism, Greece, Korydallos, Nikos Maziotis, Pola Roupa, Revolutionary StruggleLeave a comment on Pola Roupa gets life plus 25 years jail accused of blowing up Greek Central Bank without victims. 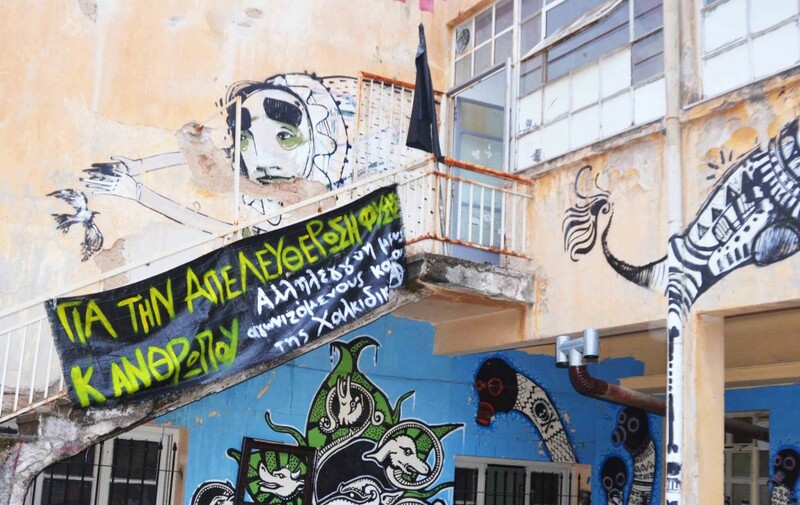 24/02, early in the morning, a group of police special forces (EKAM) entered Korydallos prison and abducted comrade Konstantinos Giagtzoglou (who is on hunger strike since 21/02 demanding his permanent transfer in Korydallos prison, located in Athens) in order to transfer him to Larisa prison. The comrade fought back which resulted in him being injured by the pigs. He wasn’t allowed to take any of his stuff, not even his medicine. 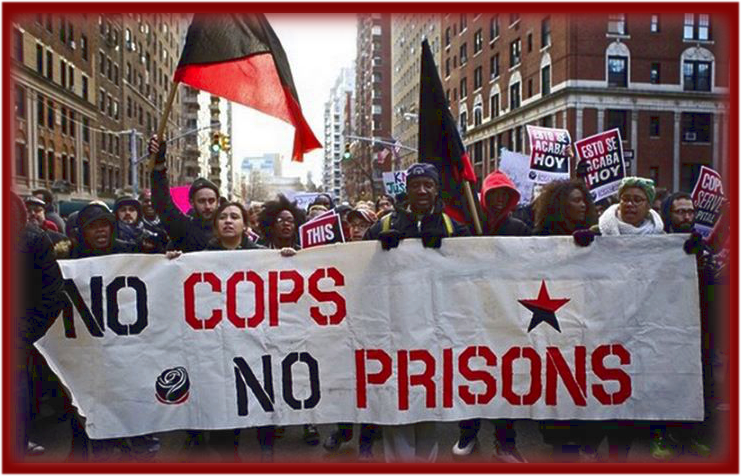 As an immediate response, the rest of the prisoners rose up and captured all prison wings, demanding a meeting with a representative of the Justice Department. 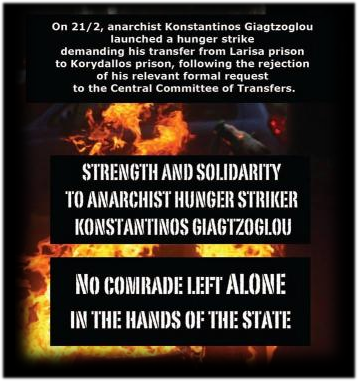 They demand the immediate return of Konstantinos in Korydallos prison. As a result of the massive mobilization in Korydallos, Malandrino and Chania prisons, a representative of the Justice Department has met with representatives of the prisoners in Korydallos prison (the whole prison was occupied by the prisoners for 5 hours) and has promised them that there will be a new council in session in Monday to examine our comrade’s demand. The prisoners ended the occupation warning him that they will take action again if the comrade’s demand is not met. These images were leaked out of Moria refugee camp in the island of Lesbos in Greece, exposing the dreadful and inhumane conditions that migrants are being forced to endure in order to survive in – 5°C / 23° F, sleeping in tents, on the frozen ground, under heavy snowfall. 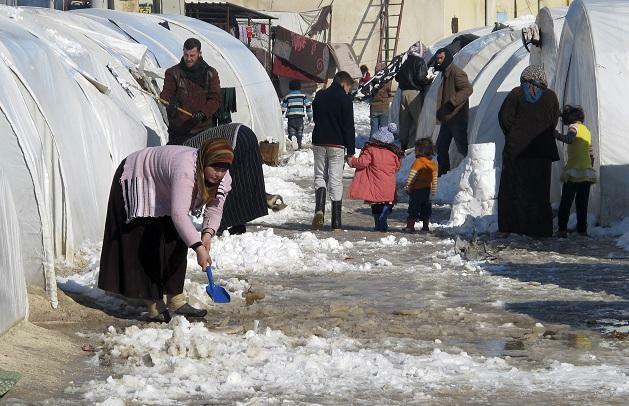 The severe weather conditions had been foreseen and expected for many days before, and yet hundreds of people that sacrificed everything to escape to “civilized” Europe have been left to their own demise. 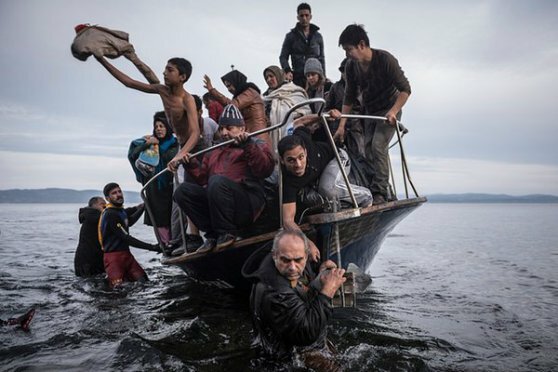 While the world’s media is suitably distracted by the Olympic Games in Brazil, the war in Syria and beyond continues to see thousands of people – men, women and children – killed each week and many more attempting the perilous journey as refugees to seek safety. Meanwhile in the last two months there has been a deafening silence in the media about the plight of the thousands of refugees still stuck in Greece. Only 2500 refugees have so far been granted asylum status – the process is excruciatingly slow and most of those granted this status have yet to be relocated. A report by the Greek Centre for Disease Control recommended all 16 of the refugee detention centres it inspected be closed due to unsanitary conditions and poor water supply. 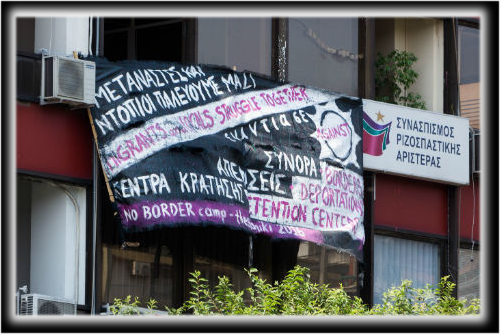 But while the Greek authorities seem unable to move forward, grassroots activists – anarchists – have yet again taken matters into their own hands and are providing shelter and food to those in need. However, this is not charity, or the result of a philanthropic endeavour, but direct democracy in practice. As explained by the Marea Refugees Support Collective, thirty people have been expelled to other “unspecified” camps and there have been some 50 arrests. 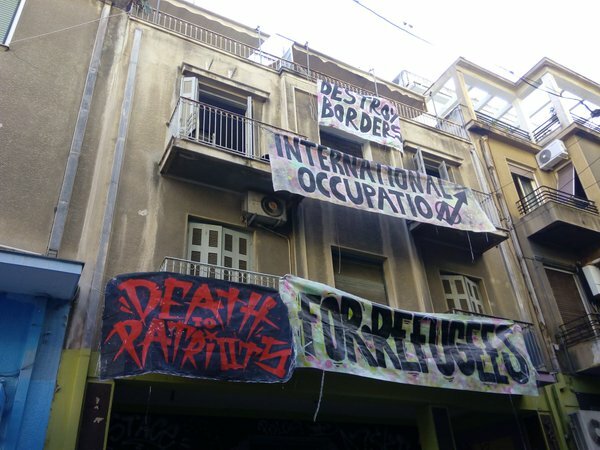 Three houses where dozens of refugees were staying in Thessaloniki have been vacated by order of the government of Tsipras , according to reports from support collectives on the scene. One building, a former orphanage, is being demolished. As they explained to La Marea, 32 refugees have been transferred to other “unspecified” camps and there have been around fifty arrests.